Pub hidden in an alleyway by Leicester Square Station. Its location means that it's probably the least crowded pub in the area, though it can still end up being "standing room only". There's a room upstairs with additional seating, but on Monday, Tuesday, and Wednesday evenings this is reserved for comedy acts. There is some seating outside in the alley, too. There used to be some interesting decor on the ground floor photo 1, photo 2, but as of August 2011 this has all been papered over. When Kake visited on a Wednesday afternoon in April 2008, there was almost nobody else there at 3pm, but people started arriving around 5pm and by 7pm the place was packed. It was a bit weird early on, since it's not really the kind of pub that feels right when it's empty, if that makes sense. Very quiet background music earlier in the day, which was either switched off or drowned out by conversation later on. They have four handpulls. Beers available in April 2008 visit were London Pride (£2.96/pint), Bombardier, Greene King IPA, and Old Peculier (£3.09/pint), while on a January 2009 visit, it was just London Pride and Exmoor Hart. 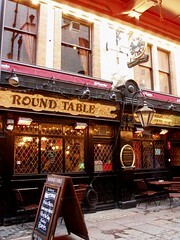 In August 2011 the ales were London Gold, Timothy Taylor Landlord, and Greene King IPA. They do food, possibly all day. A menu seen outside in April 2008 had mostly fairly standard pub food, with burgers priced between £6.50 and £7.50 (including a "breaded falafel burger" at £6.50) and mains priced between £5.25 (pasta salad) and £8 (8oz rump steak with all the trimmings), as well as a couple of sharing platters — antipasto or "Eastern" (curry-themed) — available after 3pm and costing £8.75 each (all prices as of April 2008). There might be free wireless. Accessibility: Ladies' loos are upstairs on the first floor and gents' are downstairs in the basement. Last visited by Kake and Sarah, August 2011. Last edited 2013-05-10 07:57:45 (version 10; diff). List all versions. Page last edited 2013-05-10 07:57:45 (version 10).